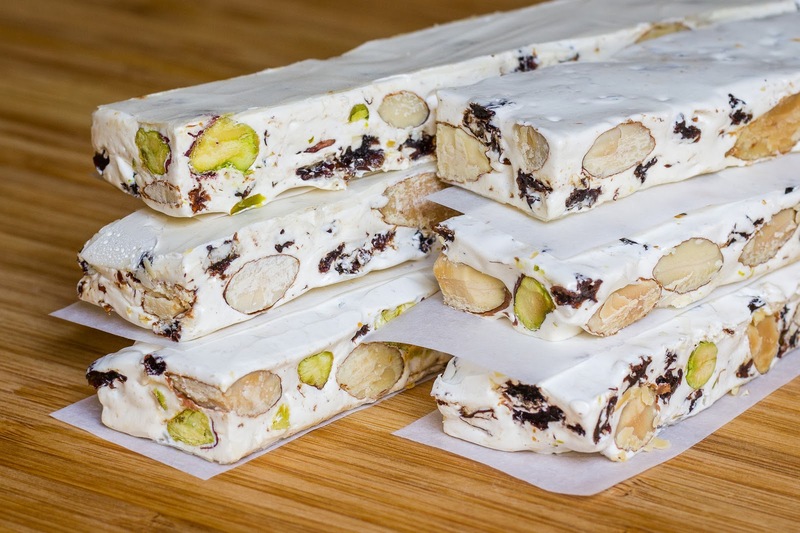 Nougat, this week's recipe, is a common Christmastime treat is southern Europe. It is made from egg whites, honey, nuts, and sometimes dried fruit. It's a popular sweet in France, Italy (torrone), Spain (turron), Greece (mandolato), and Malta (qubbajd). 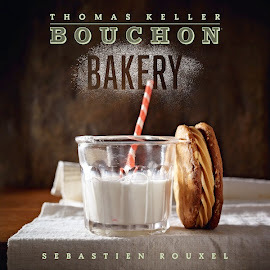 It is also used in many candy bars, including the duty-free airport favorite Toblerone, which this recipe tells you how to make with the scraps. It keeps for about a month, so it makes the perfect holiday gift to make in advance and ship to friends and family who can't be together this time of year. Another challenging recipe! I was quite intimidated by this one, since the recipe instructions emphasize that the timing is very specific. So I re-read the specifics a few times to make sure I got it right. I had all my ingredients ready to go. Except for rice paper, which wasn't listed with the ingredients. I kicked myself because I had just come from the cake specialty store, the only place where I could have found it. I asked at a few local bakeries, but no luck. I searched the internet for a solution, and the only recommendation was to spray parchment paper with Pam and hope for the best. I did find round rice paper wrappers, for making spring rolls, so I thought I'd try those. Since they were round, I cut them into squares so they'd fit the sheet pan I was using. Easier said than done. They are so brittle that it was nearly impossible to get a clean straight cut. I layered them on a half sheet pan lined with parchment paper. After a few minutes, the edges started to curl up, so I weighed them down by placing a cutting board on top while I prepared the mixture. The part of the recipe I was most worried about was actually the easiest. Although I could have used a second candy thermometer. With all my ingredients measured out and ready to go, the process went smoothly. Whipped egg whites, heated honey, heated sugar syrup, all good. When I added the sugar syrup to the egg whites and honey in the mixer, it foamed up so big I was afraid it would spill over the top of the mixer bowl and all over my counter, but it didn't. It did get all over the top of the whisk though. It looked really cool, like a science experiment. After a few minutes of mixing it calmed down. I mixed it for 16 minutes, as recommended, but the mixture was still quite not, not warm. So I let it go for a few more minutes. When I added the nuts and currants, it was super hard to mix together. When it was time to spread the mixture out onto the sheet pan, the rice paper had curled up so much I couldn't use it. So I scrapped it and just used greased parchment. The mixture was so stiff and hard I could hardly get it out of the mixer bowl. I thought my spatula would break off. I almost gave up and tossed the whole thing, but I managed to get most of it out and onto the sheet. I layered pieces of rice paper on top to try and smooth it out, but they kept cracking, and the edges that weren't directly touching the nougat curled up too. So I put another big piece of parchment on top, and covered it with another sheet pan, which I then weighted down with books. The nougat isn't in a nice even layer, but after sitting overnight it should be ok. The next day I nervously went to cut the nougat into slices. I removed the weighted sheet pan from the top, and to my surprise, the nougat came right off the greased parchment! I was afraid I'd be peeling parchment paper off all day. I did however peel off the rice paper where it overlapped and didn't touch the nougat directly. Cutting through the sticky nougat was difficult and required a bit of elbow grease, but I managed to get equal sized long strips of nougat. The scraps were more munching. I love the honey flavor, and the pistachios and almonds lend a nice contrast to the sweet nougat. I also like that these keep well for a month, so I will wrap them up for Christmas gifts when I visit my family later this month. Although this was a very difficult recipe, and created quite a fuss, it's worth doing once a year.